Are we sufficiently excited for 7-2 Gophers vs. 7-2 Nebraska? Did you think you wouldn’t have to care about the Gophers this season because this had the makings of a transitional time under first-year head coach Tracy Claeys and new AD Mark Coyle? I know this tends to be a pro sports market. I know Gophers football hasn’t exactly lit the world on fire for the past half-century. I know Minnesota’s current four-game winning streak rings hollow with a lot of people considering the soft schedule it has come against. But I’m still incredibly underwhelmed by what I perceive to be this market’s interest in the Gophers’ upcoming game at Nebraska on Saturday. Both teams are 7-2. The game is in prime time. This is serious. 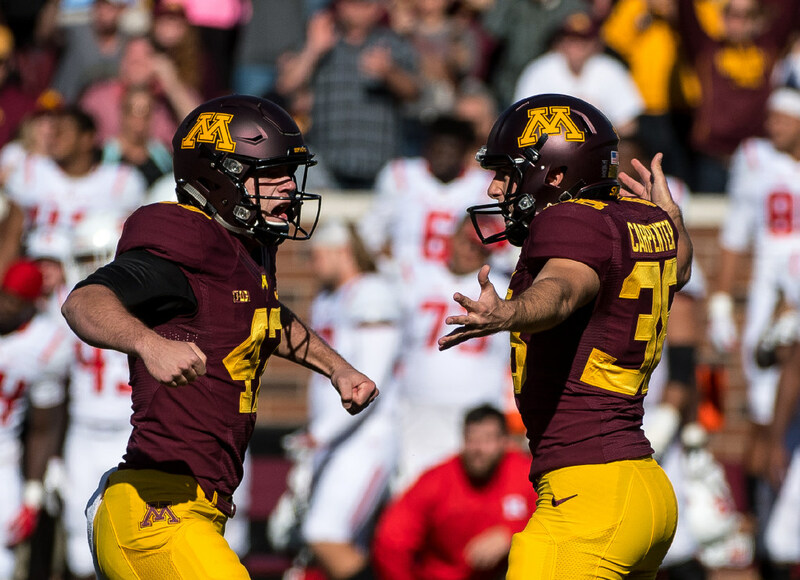 Four consecutive conference wins, regardless of opponent, is an accomplishment — and it’s afforded the Gophers this opportunity: win all three of their remaining games, starting at Nebraska, and Minnesota will win the Big Ten West and play in the conference title game. Win two of the next three and they’ll go to a very nice bowl game — and still have a decent chance of winning the West, depending on other outcomes. Granted, the next three games are difficult — at Nebraska, home vs. Northwestern, at Wisconsin. There is no more Illinois or Purdue. There is no do-over for the one that got away at Penn State. That said, the Huskers are only a touchdown favorite. This is not the Nebraska juggernaut of old. Its conference wins are over Northwestern, Illinois, Indiana and Purdue. Its most recent loss was 62-3 against Ohio State. Did you think you wouldn’t have to care about the Gophers because this had the makings of a transitional time under interim-turned-permanent head coach Tracy Claeys and new AD Mark Coyle? Did you tune out after a pair of painful Big Ten losses to start the year put the Gophers at 0-2 in the conference? Did the too-close call against lowly Rutgers scare you away? Are you bored by their style and done with the Mitch Leidner era? Did the Vikings’ 5-0 start cause you to focus all of your football attention in that direction? @RandBall gophers are going to get throttled. They’re barely beating the bad teams they’ve been playing all year. IMO. @RandBallsStu @RandBall I am not excited because everything points to the Gophers getting stomped by 20+. @RandBall I’m pumped. Gophers are quietly having a great season and positioned to make some noise in November! This is all we can ask for. Your choice. All I know is the Gophers haven’t lost in more than a month. The Vikings haven’t won in more than a month. If you’re going to get your heart broken, maybe at least do it with positive momentum?